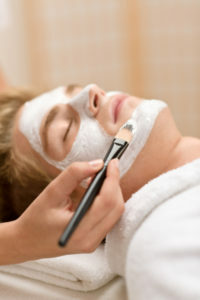 Nowadays, men are having salon treatments more and more because they care about their appearance. Both personally and professionally, pride in your appearance, is not vanity, but a sign that you wish to make the best impression, both for yourself and for those around you. The sooner a man begins a good personal care routine, the more he will reap the benefits as he gets older. When you meet someone for the first time, your face gives them a strong impression of how you present yourself. For deep down cleansing and a definite improvement in skin tone why not try a facial? Once you have experienced a facial you will soon realise the benefits of regularly caring for your skin and the results will last a lifetime! A facial is a vital step towards healthy skin and typically include a cleansing procedure, a toning procedure, the application of a face mask (suited to your skin type), a soothing face massage which also includes the neck and shoulders and moisturiser. A face massage also relaxes the facial muscles and is very important to delay the onset of wrinkles. A balancing Facial designed for combination problematic skin needing instant comfort. Facial includes Steam, Deep Cleansing, Toning, Gentle Exfoliation, Hydration Mist, Organic Clay Mask, Moisturiser, Eye Gel and Lip Balm. Includes a Face, Neck & Shoulder Massage. A hydrating Facial designed for dry skin needing moisture. Facial includes Steam, Deep Cleansing, Toning, Gentle Exfoliation, Hydration Mist, Organic Clay Mask, Moisturiser, Eye Gel and Lip Balm. Includes a Face, Neck & Shoulder Massage. A nourishing Facial designed for normal skin to maintain its balance. Facial includes Steam, Deep Cleansing, Toning, Gentle Exfoliation, Hydration Mist, Organic Clay Mask, Moisturiser, Eye Gel and Lip Balm. Includes a Face, Neck & Shoulder Massage. A refreshing Facial designed for oily skin to maintain its balance. Facial includes Steam, Deep Cleansing, Toning, Gentle Exfoliation, Hydration Mist, Organic Clay Mask, Moisturiser, Eye Gel and Lip Balm. Includes a Face, Neck & Shoulder Massage. A soothing Facial designed for sensitive skin to provide a little TLC. Facial includes Steam, Deep Cleansing, Toning, Gentle Exfoliation, Hydration Mist, Organic Clay Mask, Moisturiser, Eye Gel and Lip Balm. Includes a Face, Neck & Shoulder Massage. A manicure has long been an accepted part of a man’s grooming ritual. Having well manicured hands are an asset. It is said that you can tell a lot about a man by the conditions of his hands and nails, so don’t let your nails let your appearance down. A manicure cares for the hands, cuticles and the nails. It is a grooming treatment that uses a variety of tools, creams, and massage techniques designed to improve the look, texture and health of both the nails and skin of your hands, as well as leaving them looking well cared for. Includes Soak, Cuticle and Nail Treatment, Nail Filing and Shaping, and nails buffed to a shine. Includes Soak, Cuticle and Nail Treatment, Nail Filing and Shaping, Aromatic Hand Exfoliation, Hand Massage and Nails buffed to a shine. Your feet bear the full weight of your body as well as providing you with motion. Feet are vital to health, fitness and comfort in daily life and should never be neglected. A pedicure will keep your feet looking and feeling their best. Toenails should be regularly trimmed and kept short. Pedicures will supplement the day-to-day car of your toenails and will also indicate if there are any areas that need treatment. Includes Cuticle and Nail Treatment, Nail Filing and Shaping and nails buffed to a shine. This pedicure is especially designed for feet requiring rejuvenation and some “TLC”. Includes Foot Spa, Cuticle Treatment, Aromatic Foot Exfoliant to remove dead skin cells, removal of dry skin on heels, Aromatic Foot Mask plus a Foot Massage, Toe Nail Shorten and Shape, Nails buffed to a shine. Paraffin Treatments soften hands hydrate skin, improve circulation, rejuvenate skin colouring, and ease joint stiffness. Firstly we exfoliate your hands or feet then they are submerged into a warm wax bath until the wax takes on the look of a glove. Then your hands or feet are placed in towelling mitts while you relax. It’s during this relaxation stage that your muscles really begin to release any tension they may be holding and the skin becomes rehydrated. After the treatment your hands or feet feel silky smooth and will have a more youthful appearance. Waxing of the body from the chest downwards has become fashionable for men in recent years. There’s no reason to be embarrassed about wanting to look good and feel good and reduce the need to groom less. Stray hairs should be neatly plucked out with tweezers, and any major hair removal should be done by a professional using wax. Who doesn’t want their hair growing back softer, finer and less noticeable?